Our next destination was Jaigarh Fort. Perched on the ‘hill of eagles’ in Aravalli range, Jaigarh stands as the majestic protector of Amber. This rugged, red sand stone fort is an ancient construction which dates back to the 11th century AD. Even though there are no clear evidences, it is believed that Raja Kakil Dev started the construction of the fort. In 1726, it was renovated and expanded by Raja Sawai Jaisingh II. Jaigarh fort was built according to the ancient Indian architecture called the śilpa śāstra. There are seven different styles of forts described in śilpa śāstra and Jaigarh fort is of the type “giri durg” or hill fort. We started climbing the way up to the Jaigarh fort. It is on the way to Amber fort, but at a higher altitude. The Ghat roads leading to the fort are quite steep and convoluted. Our driver kept reminding us that it might be a hard ride. However it was a cake walk for us as we belong to a hilly area of Kerala called Wayanad. When it comes to climbing hills, we are the masters! After climbing the hill for around 10 minutes, we reached the entrance of the Jaigarh fort. There was quite a crowd at the ticket counter. We purchased an additional ticket which would let us take the car inside the fort. As we entered the fort, driver pointed out a large platform like structure, it has quite an interesting history. It is an underground water tank, which was believed to have a huge treasure belonging to the Kachwa clan. During the height of emergency in 1976, then Prime Minister Smt.Indira Gandhi ordered to have the tank opened and searched. The treasure hunt was on and troops of military came down from Delhi to fish out the gold and other precious articles from the underground water tank. As usual, Pakistan came to know about the treasure hunt and the Prime Minster of Pakistan Mr. Sulfikar Ali Bhutto wrote to Indira Gandhi in August, 1976 about it. Pakistan wanted a share of the treasure as it belonged to the ancient India which was not shared during the partition. Indira Gandhi did not respond to this strange demand then. The treasure hunt at the Jaigarh fort was in vain, at least as per the recoded history. However, many Amber residents, including our driver believes that under the cover of emergency, a curfew was declared in Amber and 60 truckload of gold was transferred to Delhi. There is no evidence to prove this allegation. It might be just an urban legend! However, there is a hilarious epilogue to this story. Indira Gandhi did respond to Mr. Bhutto’s letter, but after the treasure quest was concluded in vain. Her letter read – “"I had asked our legal experts to give careful consideration to the claim you made on behalf of Pakistan. They are of the clear opinion that the claim has no legal basis. Incidentally, the treasure has turned out to be non-existent." We entered the fort passing this famous water tank. Jaigarh fort has a structure similar to Amber fort; however it is not as artistically rich as Amber fort. Jaigarh fort was conceptualized as a protective structure mainly used for military purposes. It has the rough look which just suits its purpose of intimidating the enemies. We entered into a large courtyard called “Subhat Niwas”. This was the major assembly area of the soldiers. There is an ancient platform in the courtyard. The king might have stood here received the guard of honor from his army. There are ramps to go to the upper levels of Jaigarh fort. We walked over the ramps to reach another courtyard. This structure of ramps and courtyards are the hallmark of “Giri Durg”(hill fort) according to the śilpa śāstra. There is a decorated portico in this courtyard known as “Lakshmi Vilas”. This portico was used as the royal guest lounge. There are 12 identical marble pillars that support this portico. There are seven doors in Lakshmi Vilas allowing entry into the royal apartments.Lakshmi Vilas was built by the renowned architect Vidhyadhara Bhattacharya, who designed the Jaipur city. The king was impressed with this construction and honored Bhattacharya with Siropao(the robe of honor). Jaigarh fort offers an excellent view of the Amber fort, village in the valley and distant Aravalli mountain ranges. Our main intention of visiting Jaigarh fort was to catch a glimpse of this view. To our disappointment, there was thick fog that day, even though it was around 11am in the morning. It is indeed terrible to miss such a sight, given we have travelled thousands of kilometers to reach here. Wishing that the fog would clear out around the noon, we turned to other attractions in the fort. Next we reached a beautiful garden and it is called the Araam Mandir(Leisure Palace). There is a breathtaking view of the valley from Araam Mandir through its triple arched window. This triple arched window is called the Awaani Darwaza. As the thick fog has covered the valley, the view from Awaani Darwaza was mesmerizing; as if we were standing at the door step to the heaven of milky white clouds floating around right below us. From Awaani darwaza, we saw a lake below the Jaighargh fort. It is an artificial lake called Sagar. Sagar Lake was built in 1558, during the times of Raja Barmal. Sagar Lake is a part of an extensive rain water harvesting system that was employed in Jaigarh fort. The rain that falls on the Aravalli hills was channeled into the artificial lakes in the valley through the means of aqua ducts. Jaigarh fort is also well equipped for the collection and transfer of rain water. There were many huge tanks in the fort, which ensured that the fort never experiences water scarcity. As we were looking at the Sagar Lake and wondering about the ancient Indian technologies for rain water harvesting, the sky cleared a bit. We knew this was the time to catch the glorious sight that we came for. We ran to the nearest watch tower and looked at the valley. Amber fort, the huge walls, the village in the valley and the Aravalli ranges- all became visible through the light cover of fog. It was a glorious sight. We stood there, mesmerized. We knew it was a moment to cherish in silence, a memory to carry with us for the rest of our lives. We got just enough time to admire the view below; the fog started covering the valley again. It was time for us to turn to the next sight – A huge cannon named “Jaivana”. It is the largest iron ball cannon in the world – 20 feet long and weighing 50 tons. The hills in Amber was rich in iron ore, hence there was a cannon foundry functioning within the Jaigarh fort. Jaivana was a product of this cannon foundry and was built during the times of Sawai Jai Singh II. Even this deadly weapon is decorated with intricate metal work of birds, flowers and elephants. It was the common spirit in ancient India. Whatever they did, they incorporated art into it. I thought of the sky scrapers in Bangalore and wondered if we are really leaving anything worth adorned by the future generations. The interesting fact about Jaivana is that, it has been test fired only once and the canon never had to be used. The Rajput kings were diplomatic and powerful. None dared to enter into their forbidden fortress. It was time for us to bid farewell to the Jaigarh fort. We started our journey downhill; I looked back up at the delicate and elegant Amber fort her rugged and powerful protector –Jaigarh fort. It is indeed brave of the human kind to venture into the intimidating mountains and not only conquer it, but create majestic and marvelous constructions like Amber and Jaigarh fort. On our way back to the Jaipur city, on one side of the road we saw a beautiful palace right at the center of a lake. It appears as if just arose from the lake. It is aptly named as “Jal Mahal” Palace. Jal Mahal palace is situated in the Man Sagar Lake. Man Sagar is an artificial lake created as a result of the construction of a dam across the rived Darbhavati. It was in 1596, that the Amber area experienced a severe famine and drought. Raja Man Singh I created the dam to prevent any further drought. Water accumulated in a natural depression in the land creating today’s Man Sagar Lake. 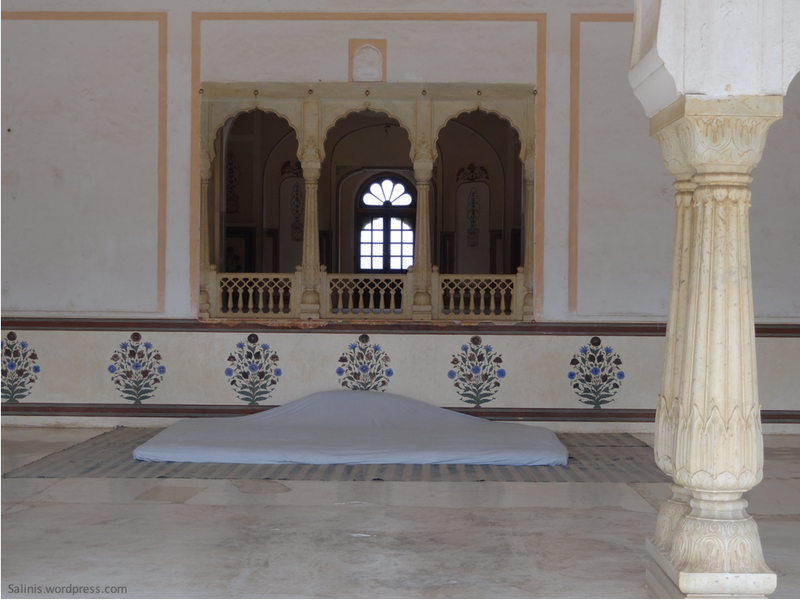 It was Sawai Jai Singh II created the five story palace named Jal Mahal. It is constructed in such a way that, all four floors would be under water when the Man Sagar Lake is full. Only the top floor with a terrace garden would be visible in those times. Once upon a time, Man Sagar Lake had rich bio-diversity. Many migratory birds visited the lake throughout the year. It is popularly believed that the Rajas conducted duck hunting parties in Man Sagar Lake and Jal Mahal was a rendezvous for such parties. We walked towards the view point on the bank of Man Sagar Lake. Entry into Jal Mahal is restricted for the public. Jal Mahal has an unpleasant past, scarred by pollution, ignorance and corruption. After independence when other palaces and monuments of Jaipur were preserved as heritage sites, Jal Mahal was totally neglected. As the urbanization of Jaipur city progressed, the garbage from the city was dumped into the Man Sagar Lake without any discretion. It did not take much time for Man Sagar to turn into a noxious swamp, which drove away all the migratory birds. Jal Mahal also was abandoned. In the year of 2000, Rajasthan government started a project to clean the Man Sagar Lake and renovate Jal Mahal. It partnered with a private establishment for this project. The project was successful to certain extend in cleaning and renovating the area. However, the contract made by Rajasthan government was under scrutiny. Around 1000 acres of area including the Man Sagar lake and Jal Mahal, which is worth nothing but a fortune, was leased to the private company for mere 2.5 crores annual rent. The lease was made for 99 years, as good as selling the land! Some environmentalists from Jaipur had accused the deal of corruption and filed a petition in Rajasthan high court. Then the case moved to Supreme Court and the court cut down the lease period to 30 years allowing the renovation activities to continue. Even though the court case is settled, Jal Mahal is not yet re-opened for public. As we silently watched the Jal Mahal and Man Sagar Lake from a distance, I wondered if I would ever be able to come back and enter Jal Mahal. All I could do was to render a silent apology for the insensitivity and selfishness of human kind, and pray that the scars we made on this serene land would soon fade. We continued our journey towards the Jaipur city and our next destination was the glorious city palace of Jaipur and the world famous Hawa Mahal.